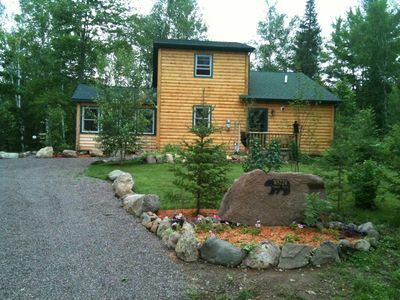 My Lake Lodge Retreat is located on 600+ acres of private wilderness in Rusk County, Wisconsin. It is a perfect place for a family or group retreats. It is also the perfect place for a private wedding, honeymoon, or anniversary. 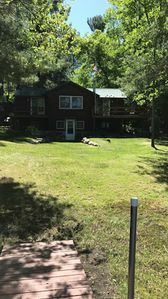 The lodge and bunkhouse are at the north end of the property on the upper lake, and there is another premium home on the south end of the property that can be rented separately, or both can be used to accommodate larger groups (see listing 4147021 - Maple Hill Escape). 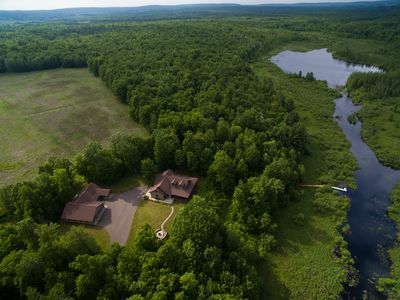 The property includes 2 private lakes, over 11 miles of private trails, beautiful woods and wetlands. Wildflowers, wildlife, and nature abound. Deer, wild turkey, hawks, eagles, Sandhill cranes, waterfowl, grouse, pheasant, loons, otters, hummingbirds, and songbirds of all kinds can often be watched from the lodge porch as well as on the trails. 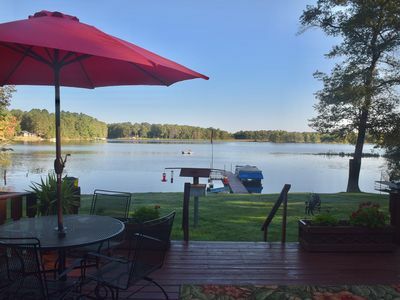 The property includes use of canoes and kayaks on the lake. Hiking, biking or cross country skiing on the trails is beautiful in all seasons. Many other activities are available on the property or in surrounding Rusk County. 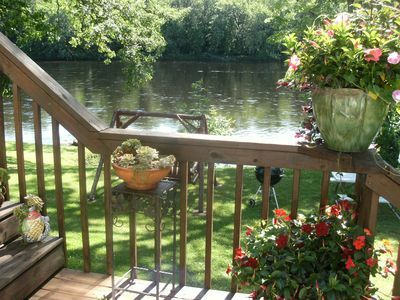 The property has a sand beach just out the door from the lodge, a private dock, and includes use of canoes and kayaks. There is a fire pit on the sand beach which is a perfect place to wind down the day, roast some marshmallows, and star gaze looking over the lake. The trails are groomed and include frequent park benches/park tables for hikers to sit, relax, and take in the spectacular views. Maps of the trails on the property are available for hikers and golf carts can be rented for use for an additional fee by request. 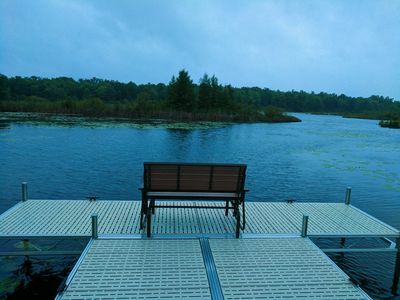 There are many groomed outdoor spaces, including "the wedding area" which is a clearing looking out at the lake surrounded by hardwoods and white pine and equipped with an electric panel for lighting or sound system use. There is a basketball area, a children's playyard (swingset, slide, climbing area), and a 6-person whirlpool/hottub. 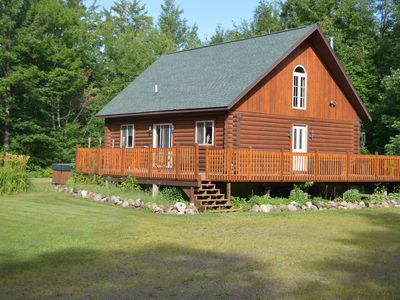 The Lodge is a spacious, 3-level, secluded log home, located on a completely private lake. It has 3 private bedrooms (pillowtop queen beds in each of the bedrooms complete with 620 count European bedding), three bathrooms with 2 double showers and 2 european style tub baths, a wood burning masonry fireplace, a professional kitchen, 2 laundry areas, a spacious wrap-around screened porch, cozy furniture with down quilts, 3 televisions with Direct TV, VHS and DVD players and use of over 200 DVDs, wireless internet access, central stereo, a massage chair, a 6-person whirlpool/hottub, and many other luxuries. With 2 people in each bedroom and utilizing the 2 sleeper sofas and porch daybeds and futons, it sleeps 14 in beds. 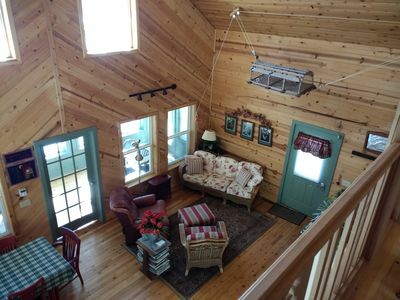 The lodge has both in-floor and forced air heating, numerous ceiling fans, and central airconditioning in the summer. 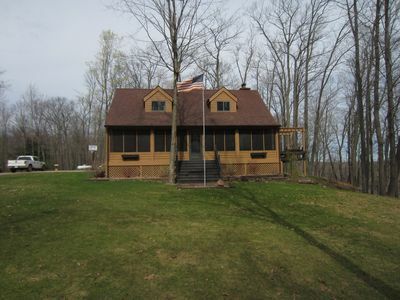 The Lodge is located with spectacular views of the lake, the sunset, and wildlife. 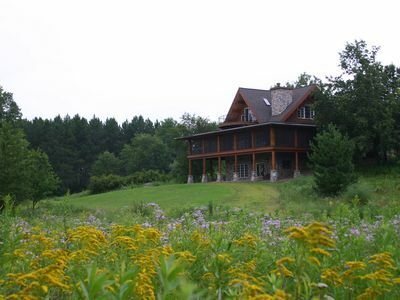 The Master Bedroom is located on the upper (3rd) level and has a step-out balcony with panoramic views of the woods and lake and is also a perfect place to watch the sunset, star gaze (I call it my private planetarium), watch the abundant wildlife and nature around you, or have a quiet breakfast. The master bedroom has a queen bed, lounge chair, TV (with DVD player), over-sized European tub with surrounding flameless candlelight, a dual-head walk-in granite shower, a separate toilet area and small laundry area with washer and dryer. Bedroom #2 is on the main level and has a pillowtop queen bed, an adjacent bathroom with a unique over-sized european tub and hand-held shower head. It also has a sliding glass (or screen) patio door that walks out onto the wrap around screen porch. Bedroom #3 is located on the lower (walk-out) level and has a pillowtop queen bed, an adjacent bathroom with antique vanity area and separate toilet and shower area. The shower is a walk-in granite shower with dual shower heads. This bedroom also walks out into the lower level family room area. The Kitchen: boasts a professional/commercial range with 2 full sized commercial-grade ovens, 6 gas burners, and a full commercial-grade griddle. There is a large subzero refrigerator/freezer with icemaker, and a large moveable center island with surrounding bar stools. The kitchen comes equipped with pottery dishware, silverware, common and uncommon utensils, cooking pots and pans, a wok, and bakeware. There are also many kitchen appliances including a 4-slot toaster, coffee bean grinder, coffee maker, crock pot, hand mixer, blender (with small food processor), hot air popcorn popper, and more. The Living Room on the main level has a masonry wood-burning fireplace, couches, a rocking chair, a television (with DirectTV access and VCR/DVD players), and a queen sleeper sofa. The Dining Area on the main level has a large Amish style wood dining table with 2 leaves extending to seat 12. There is also a bar area that is equipped with wine glasses, corkscrew, table linens, and a drink shaker. The Wrap-Around Screen Porch on the main level is a perfect place to spend the day and evenings. It overlooks the lake and woods, and surrounds you in nature while providing the comfort of daybeds, sofas and chairs with ottomans, a game/chess table with rocking chairs, and a propane fire ring to gather around on a cool evening. There is another dining area on the porch with an identical table with 2 leaves that extends to seat 12. The porch has lighting and ceiling fans and has speakers for the central stereo. There are folding tables and chairs that can be used by guests to set up buffet lines, extended dining seating, and a variety of configurations. The Family Room on the lower level has couches (including a queen sleeper sofa), a massage chair, a large screen TV with DVD player, a bookcase with over 200 DVDs and close to 40 Board Games that can be used by guests. It has a game table that can be extended to seat 10, a second refrigerator, and a piano that can be used by guests. The family room walks out into an open patio that includes patio chairs and tables, and a 6-person whirlpool/hottub. The Main Laundry area is on the lower (walk-out ) level and has a large high efficiency Whirlpool washer and dryer that can be used by guests. The Library is outside of the master suite on the upper (3rd) level and has a small desk area and books that can be shared by guests. The Front Porch is open with a protected roof and has a glider love-seat. It looks out onto the basketball area. The Children's Play-yard is adjacent to the lodge and has bench seating for adults to sit while children are playing. It can also be viewed from the wrap-around porch. It includes swings, rings, a slide, and a climbing platform for small children. The Bunkhouse is a large, pine-paneled open room over the garage with 4 queen beds, a sitting area with table, a living area with 2 large sofas and a large screen Television with Direct TV, DVD player, and optional Wii, and a full bathroom beneath the bunkhouse. There are also many available 8-inch foam mattresses for kids that can be used within the bunkhouse and/or lodge. **The bunkhouse can only be rented along with rental of the main lodge but is an additional fee with lodge rental and is inclusive of an additional 6 guests. 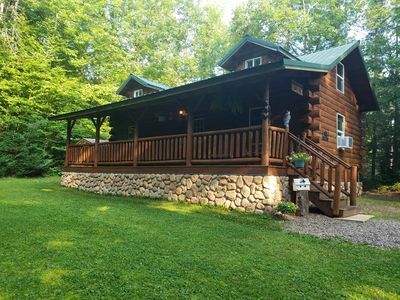 Rental includes use of the main lodge and facilities, bedding, bathroom towels, an equipped full-service kitchen, firewood, use of miles of trails, and use of canoes and lake kayaks, use of the whirlpool/hottub, basketball area and play-yard - and is inclusive of 6 guests. There is a small additional fee per person above 6 guests, and any rental above 6 guests automatically comes with the additional bunkhouse space. **There are also adjacent properties available to accommodate larger groups - please inquire. Lake Front Quite Property. 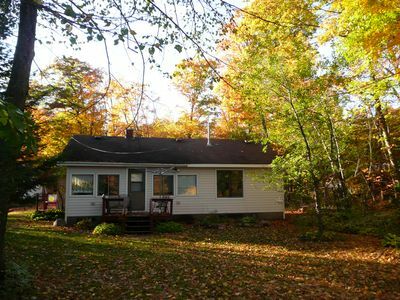 Quiet & Private, Spring Fed Sandy Beach 1.5 Acres.